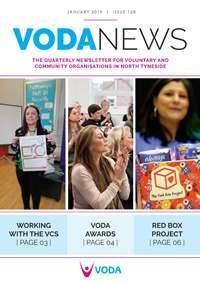 VODA News is the quarterly newsletter for the voluntary and community sector in North Tyneside. Containing all of the latest news from VODA, including a foreword from our Chief Executive, each issue also contains articles, events and updates from the local community and from the national voluntary and community sector. If your organisation has news to share or an event to publicise, we’d love to hear from you. To receive a regular copy of VODA News, you need to be a member of VODA or registered on our Community Database – sign up here. Contact us for more information or to make a booking. The next VODA News will be April 2019, copy deadline 31 March 2019. Download the latest issue of VODA News here. Thank you for your booking: Newsletters. We will be in touch soon to confirm your place.